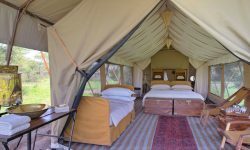 The luxurious tented camps of &Beyond Serengeti Under Canvas moves 5 times a year around the park, attempting to anticipate the movements of the Great Migration and exploring the remote and beautiful corners of the Serengeti with excellent resident game. This camp only uses private campsites giving intimacy and exclusivity. The camp consists of 9 spacious tents, each with double bed, en-suite bathroom, separate wc and al fresco bucket shower. The décor has custom made indian rugs-crisp linens, sparkling crystal and polished brass lend flair to the simplicity of camping. Each tent features a indoor sitting area and the day bed in the sitting area converts to a bed for children of under 12 years. 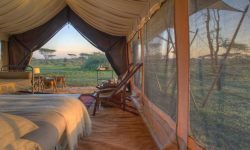 As the camp follows the migration in the Serengeti you will be close to the wildlife during the season. 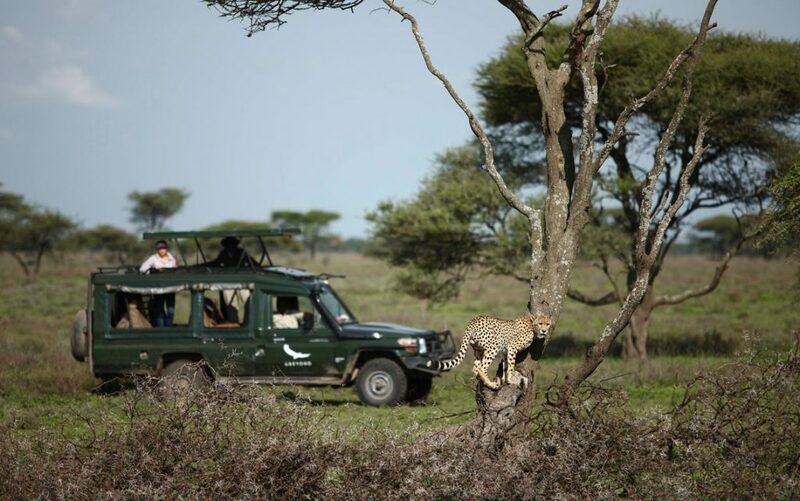 Game drives are in very comfortable vehicles with amongst the best guides in the industry. WIFI is available but slow in the main guest area.